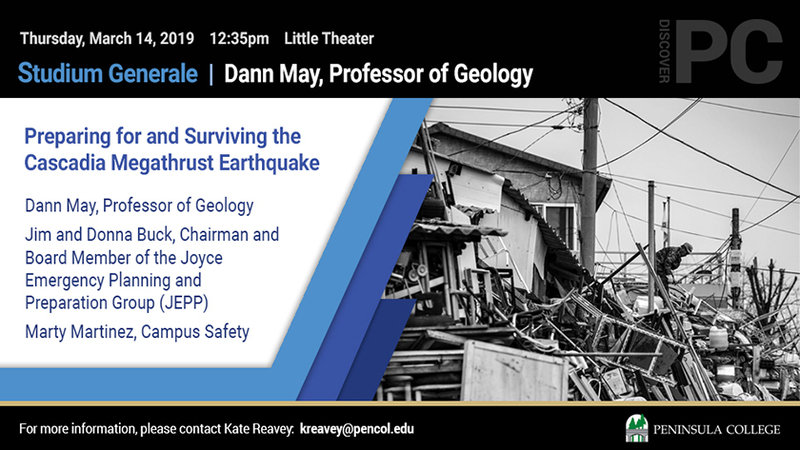 On March 14, Studium Generale will host a panel of speakers who will share information on the geology of the area, local preparedness efforts and understanding what recovery from a major quake would involve. Professor Dann May teaches course in geology, philosophy, and anthropology at Peninsula College, as well as Islam, Buddhism, and Rumi for the school’s Community Education Program and for the Academy of Lifelong Learning, Western Washington University at Olympic College, Poulsbo. He received his B.S. and M.S. degrees in geology from the University of Washington, and his M.A. in philosophy from the University of North Texas. Before pursuing his teaching career, he worked as an exploration geologist with the Standard Oil Company in Dallas, Texas. He was recently seated for a three year term as the Alternate Chair for Conservation, Olympic Coast National Marine Advisory Board, NOAA. Jim Buck serves as the Chairman of Joyce Emergency Planning and Preparation (JEPP) and was selected as by Washington State Governor, Jay Inslee, as the recipient of the 2018 Governor’s Volunteer Service Award, Disaster Preparedness and Response Category. Jim’s past presentations have included Camping in Your House, Lessons from Puerto Rico, and Emergency Prep Supplies. He holds a bachelor’s degree from the U.S. Military Academy. Donna Buck is an acting Board Member on the Emergency Planning and Preparation (JEPP) and member of the Community Emergency Response Team (CERT #1). She holds bachelor’s and master’s degrees in math and is a National Board Certified Teacher. For more information contact Marty Martinez at mmartinez@pencol.edu.